Know your audience and make your writing accessible to them. Meet your audience’s needs. If you are drafting a handout or a presentation for an English literature class, then focus your efforts on how to effectively find abstracts in ProjectMUSE instead of how many journals it has indexed. Your students' main concern is how they can get the best mark they can on their assignments, so tailor your work to meet this need while you teach them the bigger picture. This doesn’t mean you can ignore explaining what backfiles and moving walls are, but it does mean tailoring your talk on JSTOR so it can perhaps emphasize the benefit of using this resource to examine a subject’s scholarly record. Put your audience’s needs first and tailor your message towards them. Avoid jargon. Most students (and faculty) don’t know what “information literacy” means and most of them won’t care, either. What is important to them is the lesson or the takeaway from session, so use plain language to get your point across (e.g., try using “Effective Research Skills” instead of “Information Literacy” in your first-year classes). When you use plain language, you help your audience focus on the significance of your argument instead of what you mean by the picky words you may choose. Chunk out your information with sections and bullets. Avoid information dumps at all costs. Make sure your document, whatever it might be, is easy to skim. Do this by using headers and bullets. Mark off your work with sections, and use boldface (but use it sparingly). If your audience can’t find what they’re looking for the first time they read your document, then they’ll never return to it. Guide your reader through your document with strong headlines. This applies to projected presentations but applies to print documents, too: Make your headlines active so your audience knows what to do with the information you give them. A headline such as “MLA Database” may help your audience know what you’re about to talk about, but it can’t guide them as effectively as “Make the MLA Database your primary research tool” can. The best headlines are contentions that your audience will be able to remember - and act upon. Writing isn’t rocket science, but it can take effort. Remember that the words we use stand beside us when we’re presenting to students, and stand in for us after the class has ended. So make sure your writing - whether it’s a handout, an e-mail, or a PowerPoint deck - is accessible and meets your audience’s expectations. I get to try new things with a minimum of bureaucratic nonsense. I've written posts about gaming and about popular reading materials. I know I'm not the only academic librarian doing these things, but whenever I talk about it among librarians I hear jealousy from librarians at bigger schools. I have developed personal relationships with most of the faculty. At bigger institutions, I know I'd be lucky to know all the members of the departments to which I was the liaison. We have 79 full time faculty members, so I've gotten to know them and vice versa. I have developed personal relationships with many students. I serve as an adjunct instructor. I have refereed late night dodge ball. Heck, a past student senate president used me as a clue in a scavenger hunt because I'm "the librarian everyone knows." I get to wear many different hats. I am: the coordinator for our instruction program; on a couple of important campus wide committees; the liaison to five different departments; responsible for marketing and outreach; and leading our assessment efforts. (This is just the high level stuff.) I'd get bored if I had to concentrate on just one of these, even if it were for a larger group. Most importantly, my voice is heard. I don't have to go through channels or wait my turn. I get to speak... and people listen. Further, faculty come to me and ask for my feedback. I can't imagine not having a say in the life of my institution, but I don't have to worry about it at a small school. What do you think? Am I crazy? Also, what do you like about your library? I’m sure you’ve heard about recent studies and their dire warnings that “sitting kills you!,” but many librarians have jobs that keep us in front of a monitor for long stretches at a time. Casting aside any pretension of a discussion of the health benefits of regular exercise, I’d like to encourage all librarians to take a walk--for (library) science! One of the first things I try to do when I start a shift on the reference desk is to take a quick stroll around the area I’m responsible for. I collect a few books for the put-away shelf, discover if any teen couples are skulking together in the dark recesses of the stacks, and generally make sure that everything is in order. I find that walking around the library, especially the public areas, can be just as beneficial when I’m off desk as well. When you start working at a new library, becoming familiar with the layout and collection is of paramount importance, because patrons (and sometimes other staff) will expect you to know where things are. Even in an increasingly digital landscape, the location of the restrooms is still going to be high on the FAQ. Every reference question is an opportunity to create a mental map through the collection that will enable you to field “on the fly” questions with greater ease. For example, if you’re helping a patron finding books on autism and they suddenly ask for help learning Spanish, it helps to be able to guide them to that part of the collection without dragging the patron back to the catalog. Other than a basic sense of knowing where to find things--especially useful when the online catalog goes down--there are several benefits to moving around. Information on the state of the collection: What shelves are overflowing with books? Does a certain section require weeding and/or shifting? What books are patrons regularly browsing (and leaving on shelves and tables in a haphazard manner)? Opportunity to interact with patrons: A desk can create an intimidating barrier, especially for someone who fears that their question might be “stupid.” A roving librarian has the opportunity to answer questions in a setting that is somewhat more private. My director encourages us to leave the desk to assist lost-looking people and answer reference questions, although sometimes a line of patrons forms, making that difficult. Everything in moderation. General information: As I work at a reasonably large library, I’m not always sure what’s on display at any given time. Walking around allows me to peruse the thoughtful choices my co-workers have made for whatever the theme of the month happens to be. Also, I can end problems before they start. Are we low on brochures? Is there some kind of sanitary disaster brewing in the public restroom? Some things are better to know sooner rather than later. Getting outside your comfort zone: It can’t hurt to have a basic familiarity with where things are and what’s available in other departments. This is a perfect opportunity to talk to co-workers that you might not usually interact with. Talk to people who may not technically be “librarians” but have probably worked at your new library a long time. Familiarize yourself with who is responsible for what, and ask a lot of questions. Think like a patron: Is it easy to find things at your library? How’s the signage--too much or too little or too shouty? By approaching the collection as a patron would, you can get a different perspective on how well the library is working. Finally, it will give you a great excuse to get out of that killer chair once in a while. Anna Mickelsen is a reference librarian in Springfield, MA, where she answers patrons' questions, manages both fiction and nonfiction collections, and teaches computer classes. In her spare time, she blogs about collection development at Collection Reflection and shares her library experiences on Twitter (username: @helgagrace). Which Is It? Clothes Make the (Wo)Man or Don't Judge a Book By Its Cover? It seems like an odd thing to discuss on a blog about librarianship, but it turns out that how we dress as librarians is very important. Whether we're wearing sparkly, spangly, cute attire (as is appropriate for a children's librarian) or a three piece suit (more de rigueur for a law librarian), how we dress at work is more important than you think. And I do think about it, probably more than I should. You see, back when I was a baby librarian, I looked much younger than I was. Up until a year after I started working at that college library, faculty and staff would occasionally assume that I was a student upon first meeting me. Further, the situation wasn't helped by the fact that we attracted a lot of non-traditional students. As a result, I dressed excruciatingly professionally everyday. Forget about wearing jeans, I didn't even wear slacks that often. The school was in semi-rural Southern Vermont, but rare was the day that found me wearing anything but high heels. I even dressed more upscale than my director on occasion. I was trying to make a point with my apparel: I wasn't a student and I didn't want anyone mistaking me for one. I'm no longer mistaken for a student (I think the silvery-grey streaks in my dark brown hair are to blame), but I'm still trying to make a point with what I wear. Things have changed, though. I can't remember the last time I wore high heels. In fact, I practically live in my Dansko clogs. I wear jeans at least once per week, sometimes more (caveat: I always wear my jeans with a fancy top). Heck, I've even been known to wear t-shirts with graphics to events I run for students. I dress much more casually than I'd ever have considered at my previous institution. The difference is that instead of trying to stand out, as I did back then, here I'm trying to blend in... with the faculty. The combination of jeans with a white, buttoned down shirt is worn so frequently in some academic departments that it could pass for a uniform. Sure, there are some members of the faculty who always come to work wearing suit coats and ties (I'm looking at you, Political Science), but that isn't the norm on my campus. I dress with the campus norm in mind. The common factor between how I dressed as a brand new librarian and how I dress now is that my work clothes are always a reflection of campus culture. I've never actually liked the adage, "Don't judge a book by its cover," because I do that everyday as a librarian. Instead, I believe that clothes do indeed make the man or woman, and I dress accordingly. How about you? How do you pick what you wear to work (or school)? Three weeks ago I started a new job as a Librarian II at a branch of a big city library system in Texas. Since my branch’s manager position is currently vacant, I quickly found out that I’m in charge when our interim manager from another branch isn’t around, which is pretty much all the time. These are some things I have learned about managing in that time. Being “in charge” means being the point of contact. Most of the people who have been referred to me were outside contractors that were installing security cameras, electrical outlets, fixing the copier, doing the landscaping, and delivering paychecks. Now you might not think signing the forms and taking note of what was done requires any special managerial skills, and you would be right. But someone has to be the person who knows what is going on and when, and it makes sense for that to be the person in charge (in case executive decisions have to be made), even if most of the time anyone could sign that paperwork. People treat you differently. Even though I’m younger than any of the staff members at my branch except for a few of the shelvers (who are still in school), I’ve been treated with respect by those twice my age. At previous jobs where my position did not have a lot of authority, I was often treated like a child or assumed to be inexperienced because of my age. Here, even though I haven’t proven myself yet, the staff has been told that I’m in charge, and unless I do something to lose their respect, they’ll treat me as if I have authority over them. I have to remind myself of this frequently. For example, one of the reference staff was a few minutes late the other day and at the time I didn’t even notice. Later we were talking about scheduling and when the shift starts and she apologized for being late. My first instinct was to laugh it off and say, what do I care? I’m not the boss. Then I remembered, oh yeah, I kind of am. Overall, I’m pretty laid-back about that kind of thing, so it was a good reminder to remember to notice things like when the staff arrives, since that’s part of my job, at least temporarily. You’re expected to know what’s going on in your branch. Even if you were off that day, or you were at lunch when something happened and no one has had a chance to tell you what went on. Basically, even if it’s humanly impossible for you to have known about the patron who complained the building was cold this morning, as the person in charge you’re going to be expected to know. This means that it’s important to stay on top of what’s going on, and check in with the staff regularly. A simple “What’s happening?” or “Anything I should know about?” seems to work well, and I’ve gotten in the habit of asking “How’d yesterday go?” after my days off. Be careful who you trust. I’ve found it’s important to be careful whose word I take for how things work at the library. Since I’m new, I have to rely on the staff to tell me some things, and it doesn’t help that half the staff is new as well. The last thing you want is to tell a patron something, and find out later that what you said was wrong, or that the person who told you was indulging in wishful thinking when they informed you of the policy. This is crucial because A) you don’t want to give people misinformation, and B) it makes the library staff look really incompetent when they don’t know the library’s rules. I try to save my questions for people I know have been there a long time or for the managers at other branches who’ve offered to help. And last but not least… managing a branch involves way more than I realized. If you’re like me, you’ve often wondered what your manager could possibly be doing sitting at their desk all day. I have a much better understanding now. There are a million things going on at any one time that have to be handled, such as: patron complaints, work orders for maintenance, abandoned RVs in the parking lot, staff scheduling (all manager stuff), reference work, computer help, programming, and supervising (what my actual position entails). I don’t have an office or a desk, just the public reference desk, so my experience is a little atypical. I have to take whatever’s thrown at me while constantly being interrupted to help people. I love helping people, but it makes it difficult to remember and accomplish all the tiny little things that a manager would normally handle. So, cut your managers a break once in a while! They’re most likely handling a lot of small stuff behind the scenes that you would never know about unless you had to handle it yourself. Today's guest author has asked to remain anonymous. She has this to say about herself: "You can just call me an anonymous public librarian. I've worked in libraries for over 7 years, had my degree for 2, and I love books, technology and helping people. And cute shoes. That pretty much sums me up." I've talked in the past about how good it is to interact with different kinds of librarians, especially with people at libraries that are different from the one where you work (or the one where you want to work if you've not yet found your first professional position). I still stand by that, but the opposite is just as important. Until recently, I had forgotten how nice it is to flock with like feathered birds. You see, I spent time with a group of librarians who all work at libraries at small, liberal arts colleges, and it has been more invigorating than I could have imagined. Our libraries have a lot of the same strengths and weaknesses. More importantly, these people understand the context in which I work every day. For example, the importance of "library as place" means something very specific on a small, predominantly residential, college campus. Having the same backgrounds, the same vocabularies, made conversations easier and therefore more fruitful. Further, because we have similar but not identical institutions, I got some amazing ideas from these interactions... things I can't wait to try at my own library. I imagine it's the same way for other librarians. Nobody understands the stress of hoping a tax levy passes like someone who has been in the same situation. Similarly, I can see how a bibliographer at a large research university will want to keep in touch with people who have the same subject specialization. So find your people, your tribe, your flock. You won't regret it. How about you? Have you spent time with others who inhabit the same part of Biblioterra as you do? I remember the first time I was allowed into the archives at the public library near where I grew up. I didn't actually get to touch anything, but I remember the scent. I'm sure you know the one I'm talking about - the slightly sweet, almost bready scent of really old books. I love that scent. And I love old books. 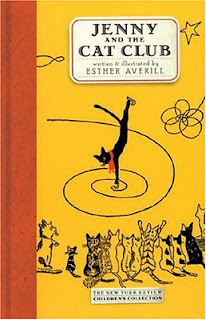 Jenny and the Cat Club by Esther Averill. The protagonist of this book is a little black cat, Jenny Linsky, who wants to join the cat club that meets behind her house, but to be a member you have to have a special talent. Jenny eventually teaches herself to ice skate. When she performs this feat for the members of the cat club, she does so while wearing a lovely red scarf that her owner, the sea captain, knitted for her. Yes, she gets to join the club. Averill wrote many Jenny Linsky books, and I own most of them. Some of them are original runs, most are reprints. In all, the drawings are charming, as is the writing. Jenny and the Cat Club is so much fun. 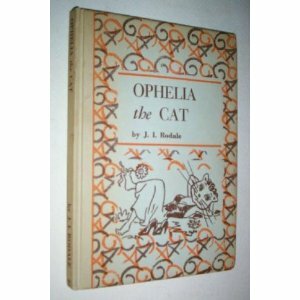 Ophelia the Cat by J. I. Rodale. This is a particularly weird one. All the cats are anthropomorphized. The cat for whom the book is named is a very chic, urban girl cat. She has to go out into the world and learn the facts of feline life. As beautiful as it is strange. Mee-Yow by Lee Priestly. This is the book that started my obsession for old children's books about cats. 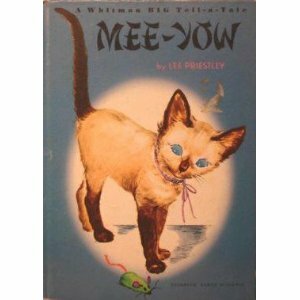 Mee-Yow, as you can see from the cover, is a Siamese kitten. During the course of the story, Mee-Yow spots a stray kitten outside and starts making a ruckus that is so loud that even the police come to investigate. At the end of the story, the stray is adopted into the family and named Mee-Too. Corny word play and hokey pictures? Yes, please. Am I a librarian because I love old books or do I love old books because I'm a librarian? The world may never know. How about you? What kinds of books do you collect? I took last weekend off from work. Let me explain: it's not that I was meant to be in the building and then switched shifts or called out. It's that I brought work home with me, committee work and the like, intending to do it over the weekend. On Saturday morning, when I booted up my computer to start working, my mind flashed to the 50+ hours I'd been on campus the previous week. That's when I decided it could all wait until Monday. So, instead of reading through new course proposals or through the materials for which the academic dean wanted feedback, I did stuff for me. I watched every episode of season five of Psych on Netflix. I ate Oreos. I did laundry and washed dishes. I spent a lot of time on my couch with my cat in my lap. I even took a nap on Sunday afternoon. (In the interest of full disclosure, I did work on a presentation I'm giving at an upcoming conference, but that's also for me - not for work.) I did things I wanted to do, not things I had to do. I'm not going to tell you that you should never do work at home, although that is ideal. For me, especially since I'm both a librarian and an adjunct professor at the same institution, getting everything done while on campus is impossible. Besides, if it's a choice between doing work while sitting on my couch, in my pajamas, or sitting at my desk, in my work clothes, I opt for the couch and the jammies. I can be a bit of a workaholic at times, but I have learned I need to take time for me on a regular basis. If you aren't careful, stress can turn to burnout. I've been there. Back when I was a baby librarian, we had some rapid changes in personnel (all for good reasons) that left me the only instruction librarian for a semester. It was a small institution, and I had great coworkers who covered my desk hours without complaint, but by the end of it I was hurting. Things got better after that. We filled the open librarian position; I took some vacation; and I was finally able to breathe again. The story had a happy ending, but I never want to feel like that again. As you move forward in your career (whether you're a denizen of Biblioterra or work in another field), I hope you can learn from my mistakes instead of making your own. As much as you might love your job, you need other things in your life. It could be a pet, a hobby, spending time with friends, or even a television show that makes you laugh. There will come a time when you'll need it. How about you? What do you do to handle your stress?